You may have noticed that the site was down for most of yesterday, the result of a botched DNS update.Â I’ve corrected things and everything should be OK now, but please let me know if anything else looks wonky. Thus far I think I like the paperclip temples better – the wooden temple is trickier to place and blocks my view of the fabric – but I am persevering, because these things often getÂ better with practice, and I think it probably does do a better job of holding the fabric edges out to reduce draw-in. 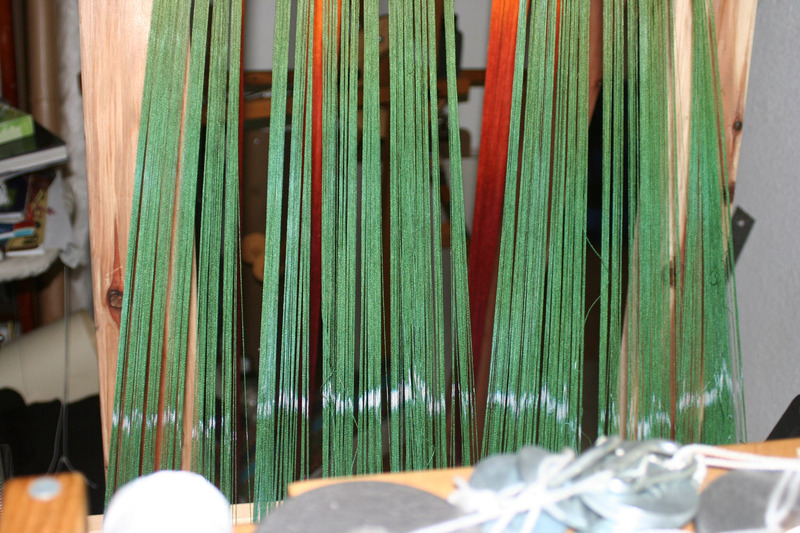 Right now they are nicely lined up, and so is the warp.Â We’ll see what it looks like after some more weaving – last time I had trouble with the bouts “taking up” at different rates.Â I think I’ve fixed that problem, but only a test run will say for sure.Â Fortunately, I had the foresight to leave plenty of warp at the beginning for testing – nearly a yard of white warp that I can weave up as a test. Plans for this week: do the sampling and take the various measurements necessary to create the knitted blank; knit up two blanks, one for each panel; start scanning the magazines.Â I am deliberately not planning on doing much weaving, because someone is coming by on Saturday to see my loom (she is thinking of purchasing an AVL WDL).Â I’m not sure what she will think of the Frankenloom that is currently set up (with the trapeze, live-weight tension, LED loom lighting, enlarged back beam, etc., mine is not exactly a factory-configured AVL), but she should be able to weave on it and get a feel for how the AVL WDL works and how it fits her body.Â Which is at least 50% of what matters. 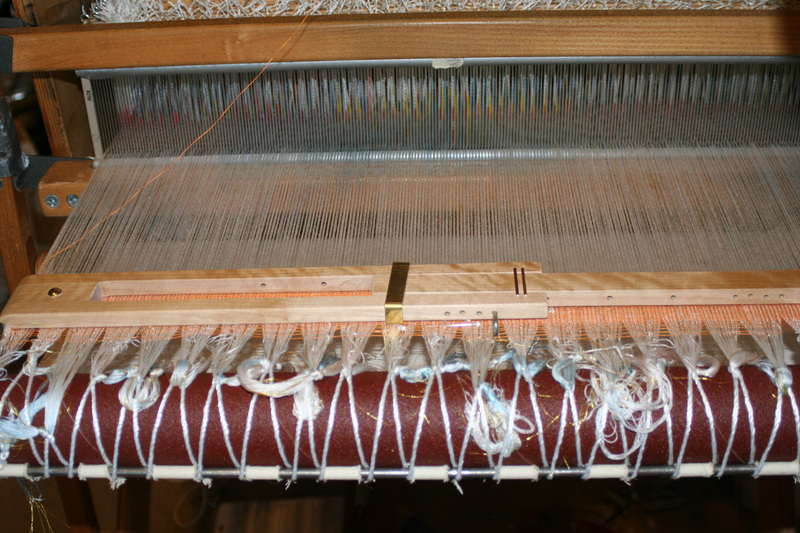 Anyway, because she is coming over, I don’t want to weave up the entire sampling section of the warp before she arrives – that way she can play to her heart’s delight without worrying about screwing up anything “real”. And now, off to prep for work!Â Today’s the first day of my new job, and it will be interesting to see what transpires. I do need to mingle the bouts near the edges, as some striping is evident where the bouts got out of sync.Â This is most obvious in the left-hand side of the yellow section, but is also visible in the lower right of the red section.Â It’s much more obvious in person. I need to fix some tension issues.Â The warp was much looser on the side bouts than in the center, resulting in much more take-up – about 4″ over the first 24″ – which meant the bouts got out of sync.Â I have some ideas of what is wrong and will take steps to fix it in the next set of samples. 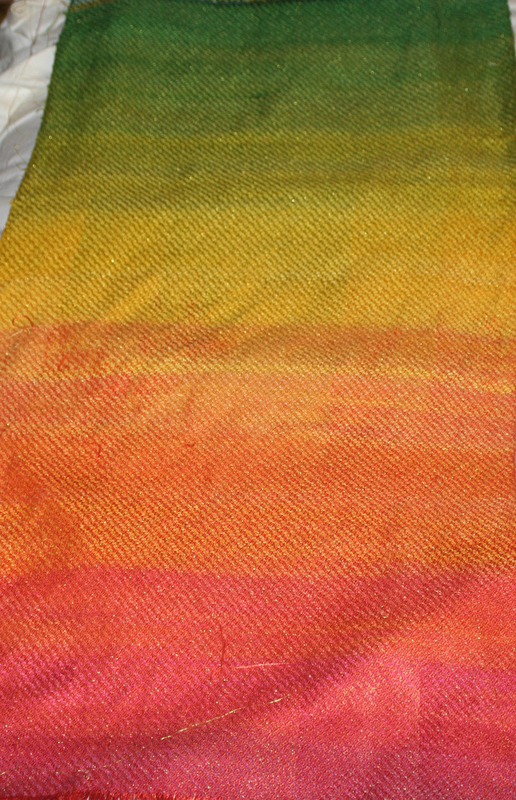 I need to make the transitions between colors more gradual in the knitted blank.Â There’s some pretty pronounced striping where the color changes happened too fast. I’m not sure I like the effect of switching to the silk.Â The fabric is heavier (at 7000 ypp, it’s nearly 20% heavier than the tencel) and as a result, does not drape as well.Â Shorter floats may contribute to the effect. At this point I am not quite sure what to do next.Â Do I continue on in silk, or switch back to tencel?Â Do I try a sample in 60/2 silk (for a lighter fabric), using the old color set?Â I am baffled by the options.Â I am going to take a day or two to meditate on this, and meanwhile work on my Handwoven article.Â But I have the feeling I will go back to the tencel, and weave (yet another) sample, in the original colors, this time at full width. 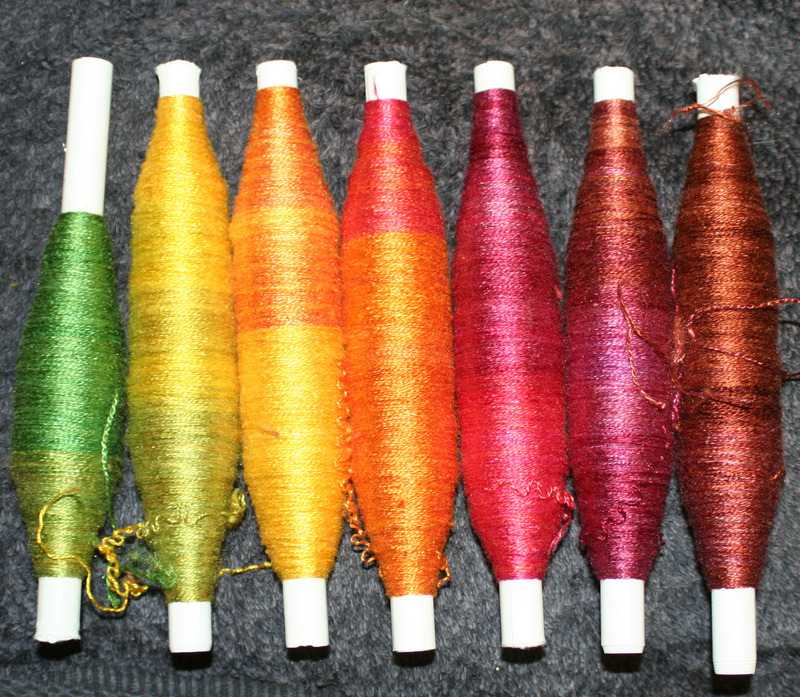 By working diligently (okay, obsessively 🙂 ), I have managed to get the first blank knitted, dyed, unraveled, and on the loom.Â Here is a shot of the pirns – aren’t they pretty? My only critique (so far) is that some of the color changes lo0k more abrupt than I’d like.Â I will keep an eye on this as I weave it off, to see if I need to modify my painting technique for the next blank. 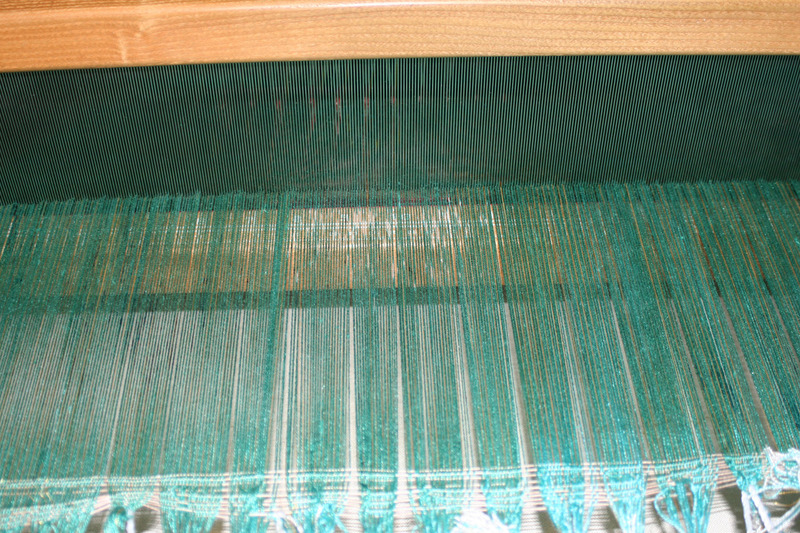 I am still weaving the header, as you can see; as soon as the warp evens out a bit and the bouts are fully separated, I’ll start debugging the warp.Â Hopefully there shouldn’t be too many threading/sleying errors – it’s threaded up straight draw, which is easier to thread/correct than a more complex threading! 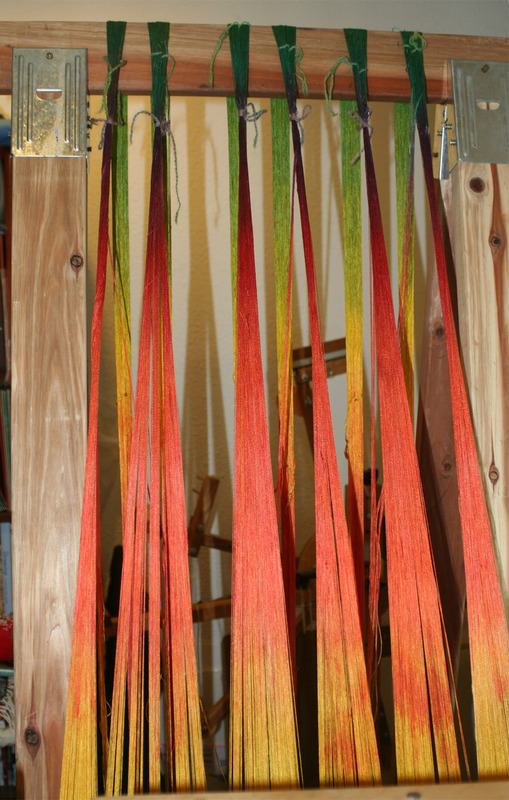 The ties for the registration marks are at the top (enlarge the photo to see them more clearly).Â I have got them lined up to within about 1/2″ of each other.Â See how that lines up the warp color changes as well? I’m a little concerned about the splotches of orange in the yellow/gold sections, and whether that will result in visible vertical lines at the edges of the bouts.Â If it turns out to be a problem, next time I will do as Julie suggested a few blog posts back and interpolate the bouts – one thread of one bout, one thread of the next bout – either through the entire bout or just at the edges, to blur them a little. 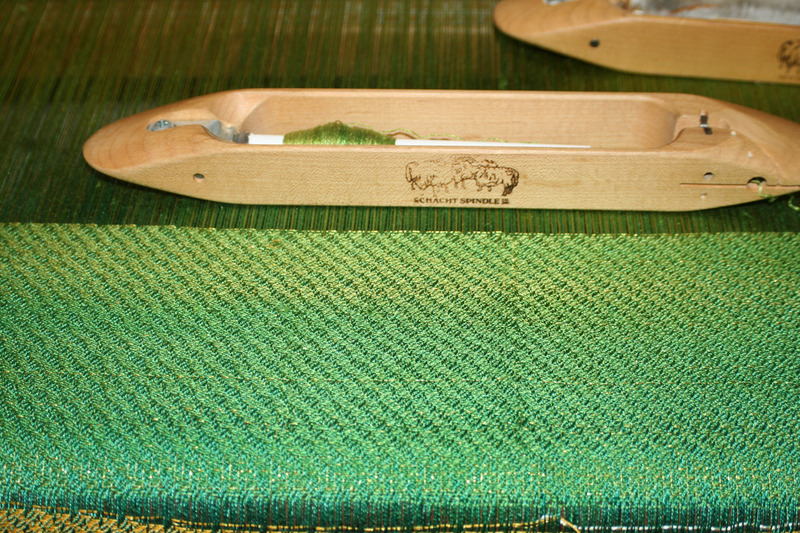 But on the whole, I’m happy with the setup.Â Now let’s see what happens when I actually start weaving!